Some apps call Microsoft Graph with their own identity and not on behalf of a user. In many cases, these are background services or daemons that run on a server without the presence of a signed-in user. An example of such an app might be an email archival service that wakes up and runs overnight. In some cases, apps that have a signed-in user present may also need to call Microsoft Graph under their own identity. For example, an app may need to use functionality that requires more elevated privileges in an organization than those carried by the signed-in user. Apps that call Microsoft Graph with their own identity use the OAuth 2.0 client credentials grant flow to get access tokens from Azure AD. In this topic, we will walk through the basic steps to configure a service and use the OAuth client credentials grant flow to get an access token. 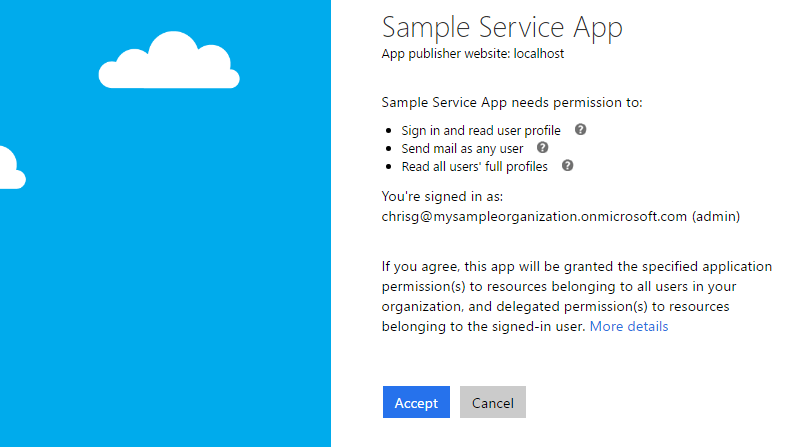 Configure permissions for Microsoft Graph on your app. Use the access token to call Microsoft Graph. To authenticate with the Azure v2.0 endpoint, you must first register your app at the Microsoft App Registration Portal. You can use either a Microsoft account or a work or school account to register your app. The following screenshot shows a web app registration that has been configured for a background service. The Application ID assigned by the app registration portal. An Application Secret, either a password or a public/private key pair (certificate). A Redirect URL for your service to receive token responses from Azure AD. A Redirect URL for your service to receive admin consent responses if your app implements functionality to request administrator consent. For steps on how to configure an app using the Microsoft App Registration Portal, see Register your app. With the OAuth 2.0 client credentials grant flow, your app authenticates directly at the Azure AD v2.0 /token endpoint using the Application ID assigned by Azure AD and the Application Secret that you create using the portal. 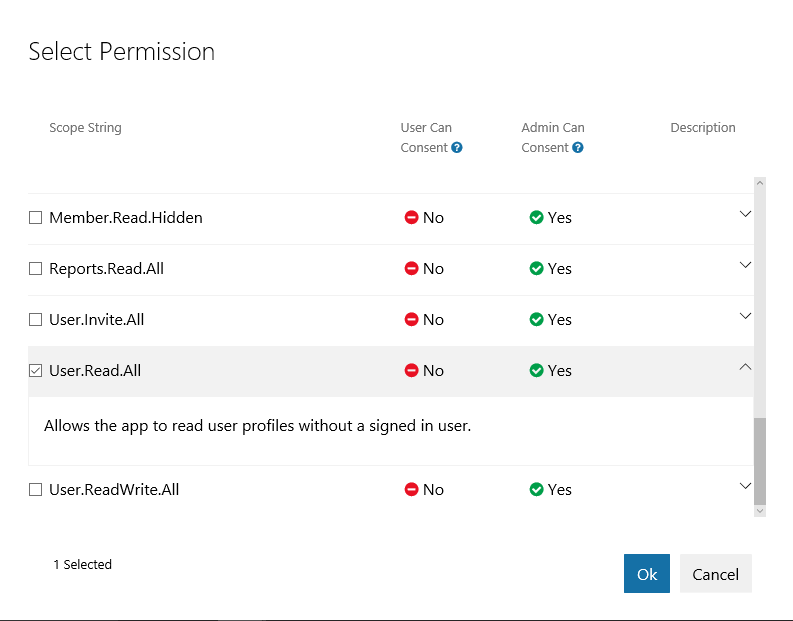 To configure application permissions for your app in the Microsoft App Registration Portal: under Microsoft Graph, choose Add next to Application Permissions and then select the permissions your app requires in the Select Permissions dialog. The following screenshot shows the Select Permissions dialog for Microsoft Graph application permissions. Note: We recommend configuring the least privileged set of permissions required by your app. This provides a much more comfortable experience for administrators than having to consent to a long list of permissions. You can rely on an administrator to grant the permissions your app needs at the Azure portal; however, often, a better option is to provide a sign-up experience for administrators by using the Azure AD v2.0 /adminconsent endpoint. Important: Any time you make a change to the configured permissions, you must also repeat the Admin Consent process. Changes made in the app registration portal will not be reflected until consent has been reapplied by the tenant's administrator. // Line breaks are for legibility only. tenant Required The directory tenant that you want to request permission from. This can be in GUID or friendly name format. If you don't know which tenant the user belongs to and you want to let them sign in with any tenant, use common. client_id Required The Application ID that the Application Registration Portal assigned to your app. redirect_uri Required The redirect URI where you want the response to be sent for your app to handle. It must exactly match one of the redirect URIs that you registered in the portal, except that it must be URL encoded, and it can have additional path segments. state Recommended A value that is included in the request that also is returned in the token response. It can be a string of any content that you want. The state is used to encode information about the user's state in the app before the authentication request occurred, such as the page or view they were on. With requests to the /adminconsent endpoint, Azure AD enforces that only a tenant administrator can sign in to complete the request. The administrator will be asked to approve all the application permissions that you have requested for your app in the app registration portal. tenant The directory tenant that granted your application the permissions that it requested, in GUID format. state A value that is included in the request that also is returned in the token response. It can be a string of any content that you want. The state is used to encode information about the user's state in the app before the authentication request occurred, such as the page or view they were on. In the OAuth 2.0 client credentials grant flow, you use the Application ID and Application Secret values that you saved when you registered your app to request an access token directly from the Azure AD v2.0 /token endpoint. You specify the pre-configured permissions by passing https://graph.microsoft.com/.default as the value for the scope parameter in the token request. See the scope parameter description in the token request below for details. tenant Required The directory tenant that you want to request permission from. This can be in GUID or friendly name format. client_id Required The Application ID that the Microsoft App Registration Portal assigned when you registered your app. scope Required The value passed for the scope parameter in this request should be the resource identifier (Application ID URI) of the resource you want, affixed with the .default suffix. For Microsoft Graph, the value is https://graph.microsoft.com/.default. This value informs the v2.0 endpoint that of all the application permissions you have configured for your app, it should issue a token for the ones associated with the resource you want to use. 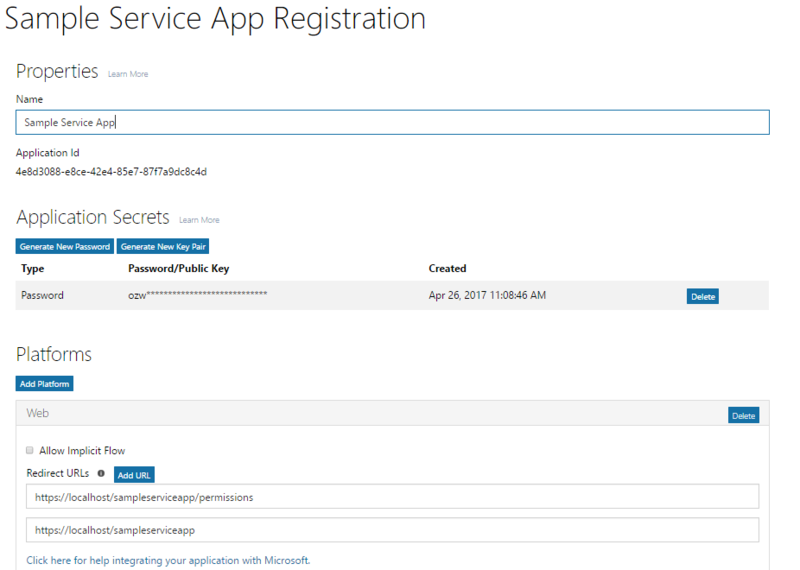 client_secret Required The Application Secret that you generated for your app in the app registration portal. grant_type Required Must be client_credentials. access_token The requested access token. Your app can use this token in calls to Microsoft Graph. token_type Indicates the token type value. The only type that Azure AD supports is bearer. After you have an access token, you can use it to call Microsoft Graph by including it in the Authorization header of a request. The following request gets the profile of a specific user. Your app must have the User.Read.All permission to call this API. Background services (daemons) that run on a server without a signed-in user. Apps that have a signed-in user but also call Microsoft Graph with their own identity; for example, to use functionality that requires more elevated privileges than those of the user. For a more complete treatment of the client credentials grant flow that also includes error responses, see Azure Active Directory v2.0 and the OAuth 2.0 client credentials flow. For a sample that calls Microsoft Graph from a service, see the v2.0 daemon sample on GitHub. For more information about recommended Microsoft and third-party authentication libraries for Azure AD v2.0, see Azure Active Directory v2.0 authentication libraries. If your app is a multi-tenant app, you must explicitly configure it to be multi-tenant at the Azure portal. There is no admin consent endpoint (/adminconsent), instead, your app can request administrator consent during runtime by adding the prompt=admin_consent parameter to an authorization request. For more information, see Triggering the Azure AD consent framework at runtime in Integrating applications with Azure Active Directory. The parameters in authorization and token requests are different. For example, there is no scope parameter in Azure AD endpoint requests; instead, the resource parameter is used to specify the URI of the resource (resource=https://graph.microsoft.com) that authorization (for administrator consent) or a token is being requested for. For quick links to an overview, samples, and a detailed treatment of the client credentials grant flow, see Service-to-Service in the Getting Started section in Azure Active Directory for Developers.